These are screenshots of the BAMZOOKi Zook Kit - a toolkit to build virtual creatures, Zooks, using a realtime physics simulation. It was developed by Gameware Development Limited for the Children's BBC gameshow, BAMZOOKi; all 24 shows were shown on TV last month in the UK. Kids used this software to build Zooks which were submitted to the BBC. Teams were selected and invited into the studio to compete their Zooks in various contests. The software is still freely available from the BBC site here along with the manual. Although designed to be easy enough to be used by kids, it is highly flexible and can be quite complex. Zooks are built from the bottom-up with elemetary component parts that the user shapes and sticks together. You are not restricted to particular body designs or topologies, although the control system uses a standard Braitenberg architecture. 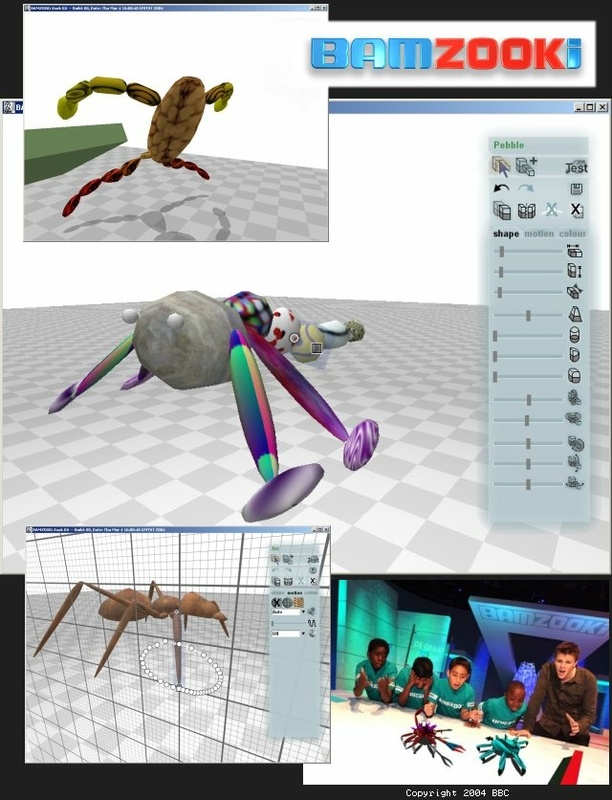 The BBC's Virtual Studio technology was used to enable realtime composition of the 3D rendered graphics with live camera feeds. Each studio camera has a dedicated render PC to render the virtual scene from that camera's perspective. To know what a studio camera's perspective is, each camera is fitted with a second 'Free-D' camera which points towards the ceiling. On the ceiling are reflective, circular bar codes. The Free-D camera data is fed to a computer system that identifies the targets on the ceiling and calculates that camera's position and orientation, 50 times a second. The contest runs in realtime on a networked PC. All the clients receive contest scene information and render their scene from their studio camera's point of view. A bank of chromakey boxes then composite the virtual and the live feed together to provide a realtime composite. This video stream can be sent to the studio camera monitors so that camera operators can view the composite and hence follow the action in realtime. There is a non-childrens user-base establishing itself, using the toolkit for their own purposes. Take a look at the Gameware Development forums if you want to see what other users are doing with it.